Today in 1960, The Houston Post Correspondent announced two of the greatest explorers were going to try and look for the Snowman, as in Abominable Snowman, in North America after several prior expeditions in the Himalayas. These two explorers are familiar to many crypto-enthusiast as Tom Slick, a San Antonio millionaire and Ivan T. Sanderson, known as the Father of Cryptozoology. Before Bluff Creek and the Patterson/Gimlin film, the Himalayas was where it was at. If you wanted to get your eyes on a bipedal undiscovered primate, you went to a mountain range in Asia. 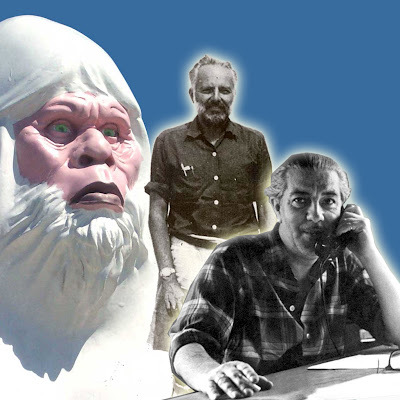 You can get a quick update about Tom Slick and the Abominable Snowman from the clip below. After the video is the Houston Post Correspondent article. The article below details the expedition to look for a "Snowman" in North America. Sunday January 10, 1960 -- Willow Creek, California - -This century's most startling scientific discovery or one of its cleverest hoaxes is under intensive study here in a snowy mountain-locked wilderness seldom penetrated by men even today. Some men of science feel the evidence they have found will lead them to a towering, powerful creature that leaves a 16-inch footprint and hurls huge objects with the ease of a child tossing a ball. They call this mysterious being a humanoid - a creature with the physical characteristics of both man and the anthropoid ape. Scoffers call it a hoax - the work of practical jokers with imagination, patience and money. But all of them - believers and cynics - speak of the creature as if it exists. And all of them call it Bigfoot. At least seven persons have said they have seen the creature, a hair covered thing of enormous size and strength. Its height has been estimated at eight or more, its weight has been estimated from 500 to 800 pounds. There is evidence to support these estimates. The scientists have been told by down to earth construction crews of heavy 55-gallon oil drums, full of diesel fuel being carried away from campsites and flung into ravines. Nearby, were the awesome tracks of Bigfoot. A 250-pound tire for an earthmover was partly carried and partly rolled for a quarter of a mile and then tossed into a ditch. Again Bigfoot's tracks were there. There was the report of big galvanized steel culverts disappearing from its site and later being found where no machine could possibly have taken it. At this moment, a well-financed expedition is quietly probing the mountains of the Bigfoot country, the heavily-timbered terrain of northern Humboldt and southern Del Norte Counties near the Oregon-California borders. Slick would have like for it to have remained a secret, without any details of its work leaking out. Slick has written contracts with everyone connected with the expedition, even including a helicopter pilot who flies supplies to the campsites, binding them to secrecy. Also involved in the expedition is Ivan T. Sanderson of New York. Sanderson received degrees with honors in geology, zoology and botany. He has headed sic expeditions to all parts of the world for such groups as the British museum, Cambridge and London Universities, the Linnaean Societies of London and the Chicago Natural History Museum. He is the author of many books; one, "Animal Treasures" was a Book Of The Month selection in 1937. Others include "Caribbean Treasure," "Animals Nobody Knows," "Living treasure," "Animal Tales," "How to Know American Mammals, " "The Monkey Kingdom," and "Living Mammals of the World." He has four books at press. There are many people who believe in Bigfoot's existence and the list is growing longer. Some of the most hardened skeptics of Bigfoot have recently reported finding evidence of its existence. They are now convinced, they say, that Bigfoot is no hoax. The interest of Sanderson and Slick, who has poured millions of dollars into the Southwest Research Foundation at San Antonio, had prompted others to take the California situation seriously. The capture of photographing of Bigfoot is expected to be very valuable commercially as well as scientifically. The analysis of his tracts, the finding of a skeleton, the analysis of droppings, described by Sanderson as being as large as those from a 1,200 pound horse, are all valuable in the expedition's study. This is not a small expedition. Slick had four camps set up at one time. Snow, Ice and the holidays brought most of the men out of the mountains recently, but there is some exploratory work still going on. Slick said from San Antonio that much of the "heavy work" would probably take place in the summer. There is a good chance other expeditions will be in the area by then. The Slick venture is known as the Pacific Northwest Expedition and is coordinated by Robert Titmus, a Redding, California Taxidermist. The exploration is being financed by Slick, F. Kirk Johnson, A Fort Worth oilman; C.V. Wood, president of Freedom Land organization in New York and Wally Heins of International Latex Company of New York. F. Kirk Johnson helped finance a snowman expedition into the Himalayas in 1957, the third in which Slick has participated. He did not participate financially in the latest Tibet-Nepal area exploration, however according to Slick. That expedition heading by two bothers from Ireland ended three weeks ago. [note: weren't those brothers Brian and Peter Byrne?] One of the men may join the California group, Slick said. Tom Slick frequently flies to California to check on the progress of the expedition operations. Johnson spent several days in one of the four camps. Sanderson reaches this conclusion in a recently published report: "There are many very good reasons for stating that the tracks could not be made by a normal man or by a machine. Therefore, there are only three alternatives. There must have been made either by an abnormal man, an animal or a creature of somewhere between the two." An engineer who examined the mysterious footprints estimated from the size and the depth of the impressions that whatever left the prints weight at least 750 pounds. Sanderson says the possibility that an animal made the tracks can be dismissed. Animals simply do not have a human foot. That leaves the alternative of what he called a humanoid, a creature in between man and animal. He points to the fact that remains of 8 to 12 feet human-like apes known as Gigantopithecus have been unearthed in Southern China. So have other similar specimens. If there were giants in those days, there could well be giants today, he said. Slick says since the Eskimos and Indians came to North America across the Bering Straits at some point in history the creature in Northern California could well have done the same thing. It is known that man inhabited the continent before the last glacial advance during the Ice Age. It is know too, that animals such as elk, mammoth, moose, brown bears, beaver, marmot, mink and other animals traversed back and forth between Asia and North America during the last million years. Some of them still survive. If some animals could survive, so possibly could sub men or ape-men says Sanderson. He concludes too, that as the ice advanced, the logical place to retreat was to high places not inhabited by man. One such place is in the Humboldt and Del Norte Counties in California and in Southern Oregon. Bigfoot's campground during the last twelve years has been in the Six Rivers National Forest. [Bear hunters found tracks in 1948] The topographic maps of U. S. Forest Service show only "approximate" lines to separate Humboldt and Del Norte Counties. Roads in general, do not cross the area. It was along a new road site that Bigfoot and his tracks were seen. There are cliffs in the area with sheer drops of l00 to 200 feet. Those cliffs are unseen by human eye from any road. Douglas fir trees hide them. Trees, which sit at the bottom of a cliff, climb straight upward, sometimes to more than 200 feet. There are trees at the top of the cliffs. They go up to a similar height. The result to the eye is the image of near vertical timberline. Much of the country looks like forests that do not spread out but instead reach greedily toward the sky. The reports of Bigfoot are not limited to Northern California. Such reports have come out of Oregon and Washington. A publisher at Agassiz, British Columbia, in Canada has stories and affidavits about the creature, known there as the Sasquatch, which date back to the 1880's. He is John Green, publisher of the Agassiz-Harrison Advance. He had made five trips to California to investigate Bigfoot. He has viewed tracks himself. He is convinced Bigfoot and the Sasquatch are one in the same. The very nature of the country the creature inhabits, if the creature exists, would dictate great strength since it apparently walks upright. The terrain demands it. Its feet dig 6 inches into steep inclines as it walks up or down by the way the tracks indicate. This reporter asked many people in the Willow Creek-Hoopa Valley-Weitchpec area [south of Bluff Creek site] about Bigfoot's feats of strength. Almost invariably they said, yes they had heard of them. Someone told them. They did not personally know it to be true. Some had not heard of the tractor wheel. Most had heard of the oil drums being tossed over embankments. Larry Blasch, a 37 years old Willow Creek Sporting Goods store owner, said two men came into his place about four years ago and told of finding a sections of corrugated pipe used for culverts. "It was a long ways from where the road ended on a ridge." He said the visitors concluded that a man could not have carried it there because of its weight. The pipe normally comes in 20 to 24 foot sections and ranges in diameter from 20 inches up. Machinery is used to move it. And then, there are the persons who say they have seen Bigfoot. It is stories like this that the Slick expedition is checking out. Some of them are ringing disturbingly true. They have collected plaster casts of Bigfoot's prints and other physical evidence. It seems well nigh incredible that in this decade of the 20th century that man would invade this mountain fastness in serious search of an American snowman. But they are and this time they are matching their dedication with cash. Wasn't there a movie or supposed to be a movie about Tom Slick? I could be wrong it happens a lot but I thought I recall hearing about it a while back. There was supposed to be a movie based on Catherine Nixon Cooke’s book, "Tom Slick, Mystery Hunter." The movie would have been titled, "Tom Slick: Monster Hunter," produced by and starring Nicolas Cage. This was back in the 90's and it never came into fruition. Thanks for the comment/question Jill!